“Is this last week's pay you were short on?” asks Jose. When does a first step grievance have to be filed? Many UE contracts have language that says the union must file a grievance as soon as it knows a grievance exists. Some contracts put time limits on the first step, “The union must file a grievance within 10 days of knowing that a grievance existed.” Of course there are contracts that have no time limit on when the first step can be filed. The common sense rule is that a grievance should be filed in the first step when the UNION becomes aware that a grievance exists. This is different than saying that a grievance must be filed when an EMPLOYEE knows it exists. The UNION refers to a steward or officer of the union, that is, someone who is more familiar with the contract than most employees. So in many cases, the clock doesn’t start ticking until it can be shown that the UNION was aware of the problem. The other point against her is the amount of time that has gone by. If she decided to change her mind within a day or so of not being awarded the job it would be a different matter. In this case, unless there is lots of past practice in similar cases, time has worked against Hester Prim and she doesn’t have a good grievance. What about Louie Lang - three weeks have gone by since he was shorted in his pay check. Does time work against him also? This situation is different for several reasons. Louie was ready to file a grievance as soon as he knew the problem existed. Of course some smart-mouth boss might say that Louie should check his pay check immediately upon receiving it, which in most cases is true, BUT this shouldn’t be grounds for dismissing this grievance. Louie is easily within the five day limit for filing a grievance once he became aware of the problem. The second reason Louie will win is that this grievance involves regular pay and there are different rules governing wages. Unless the employer has an argument that Louie didn’t work the overtime, they must pay him for time worked. This is covered not only by the union contract but by State laws. In one UE shop the union discovered that the employer had been miscalculating vacation pay for new hires. This had been going on for a year before the union discovered the problem. The employer could not claim that the time limits had passed because the union pursued the issue as soon as it became aware of the case. Now comes the difficult case, Peter Procrastinator forgetting to file a grievance to the next step. This is a situation that is irritating to many Union Stewards. 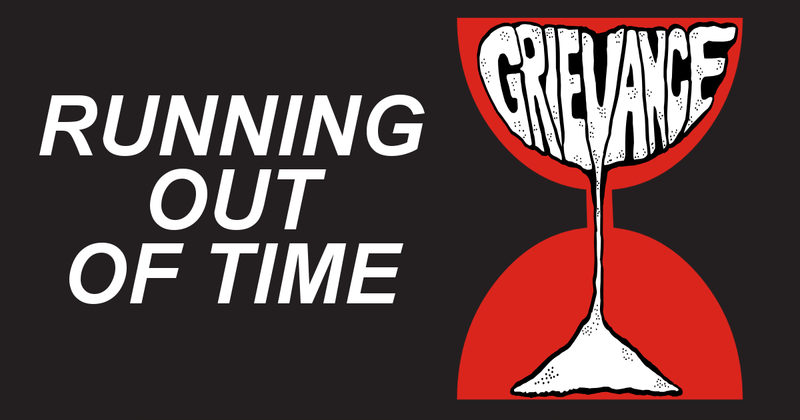 If the Union fails to move a grievance to the next step it is often considered dead, BUT if the employer fails to answer a grievance within the time limits, it goes to the next step. This hardly seems fair. In this situation Peter had better file the grievance right away. Much will depend on the past practice that exists about extending deadlines for submitting grievances to the next step. If the past practice that exists is that the employer “agrees” to extend the deadline, then Peter may be in trouble because there was no agreement to extend the deadline on this grievance. Even if the practice about missing deadlines is very loose and not followed by either the employer or the Union, Peter could be in trouble if the employer decides to refuse the grievance. Arbitrators can be very funny about this issue. They don’t see why the union can’t follow the deadlines that exist in the contract. If this is an important grievance that the members care about, then Peter’s best defense will be for the boss to know there will be problems with the members if the employer decides to play “technical games” with the union and refuse the grievance. Of course the members better be ready to follow-up with some action. The real solution to this problem is to not miss the deadlines for filing grievances. Most UE Stewards will come across this situation in their careers as union stewards or officers. The question is, should stewards use last chance agreements and how often should they be used. Stewards should start by remembering that discipline and especially discharges are only valid if there is “just cause.” Very briefly, this means the employer must have followed all the proper procedures, proved that the employee violated a rule, given punishment that is not greater than the wrong-doing, and treated all workers the same. The employer must have a valid reason for disciplining a worker and the punishment must be just and proper. The fact is that sometimes the Steward runs out of arguments and an employee like John Barleycorn runs out of chances. It is a fact that alcoholism is a disease and should be treated as a disease. It is considered as such under the Americans with Disabilities Act, but with the key point being that a worker must admit they have a problem and must be willing to seek help. If a worker refuses to seek help for alcoholism then it is harder for them to claim protection under the ADA. Most arbitrators will agree that workers suffering from alcoholism deserve several chances to get well, but at some point they will draw the line and say enough is enough. In the case of John Barleycorn, the steward may have no other choice but to make a “last chance agreement” and hope for the best. They should only be used in rare cases. Stewards should be wary of employers that want to make every case a “last chance agreement." Remember that “just cause” should prevail. Termination under a “last chance” agreement should be triggered by the employee engaging in similar behavior, not for any infraction the employee commits. For example: John Barleycorn may be terminated under his last chance agreement if he comes to work drunk again or continues excessive absenteeism. He should not be terminated for making a scrap part. That should be handled in the regular grievance procedure.